Yoga is fantastic for helping relieve anxiety. 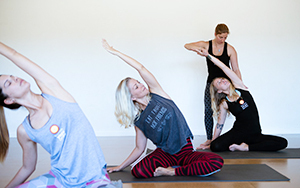 This sequence, provided by Byron Yoga Centre Teacher and Teacher Trainer, Star Rumble, is not only good for burning off the nervous energy which can contribute to anxiety but also helps maintain a healthier nervous system. Question: My 24 year old daughter suffers from anxiety. 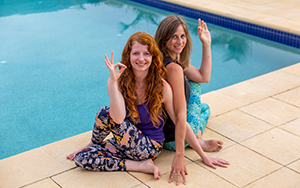 I would love to offer her more ideas and asanas to help her manage her daily challenges. Answer: Keeping your awareness on your breath and maintaining a slow, effortless exhalation during your asana practice helps to activate your parasympathetic nervous system which is responsible for calming the body and mind during times of stress. This is a general sequence for someone with no serious injuries. Stay in the poses as long as you are comfortable; the last three poses benefit from a longer stay. Once these practises are established and easy, your inner focus becomes more sensitive and you can more easily read the subtle shifts and changes in the body/breath to detect the earlier signals of an anxiety attack. A yoga practise will then help decrease the symptoms. Ujjayi and Viloma pranayama breathing practises are also calming for the nervous system and bring the most benefit in the beginning. Practise pranayama while in Savasana with the chest is open and expanding. When you are finished your pranayama, stay still and quiet in Savasana for some minutes more. A more general awareness of the breath at all times will increase your ability to focus and calm the mind. Meditation is also encouraged to build stronger concentration and focus which can eventually help lead you away from your fears. Take your practice slowly, try not to take on too much at once and begin meditating only when you feel completely ready. Please note that not all images contain the props detailed. A block, bolster or blanket is very useful for modifying all poses for anxiety – experiment with the props in relation your position to ensure you are comfortable.